Discover some of New York City’s Prohibition-era bars with an in-the-know local guide during this 3-hour Manhattan walking tour. You’ll visit four speakeasies and learn about the role these secret bars played when the 18th Amendment was in full swing from 1919 to 1933. Enjoy three provided drinks and a snack at East Village establishments such as McSorley's Old Ale House, which has only admitted female customers since 1970! Minimum age is 21 yrs due to licensing regulations. ID required. 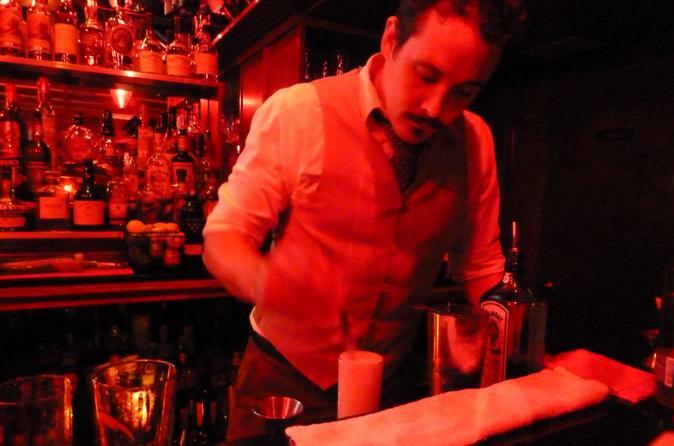 Follow in the footsteps of New York’s Prohibition-era drinkers who defied the 18th Amendment — which declared the production, transport and sale of alcohol illegal — by visiting four secret bars, aka speakeasies, located in tucked-away corners of the city. Take in the old-time atmosphere, including newspaper clippings and memorabilia that have remained on the walls since 1910. Perhaps dig into the popular cheese platter, complete with big slices of raw onion, as you sip a mug of house-brand ale. Then it’s off to three more well-preserved clandestine hideaways that were once part of the Big Apple's seamy underbelly. Three drinks and a snack are included, and you are welcome to purchase more beverages, if you wish. Your walking tour ends in the East Village.